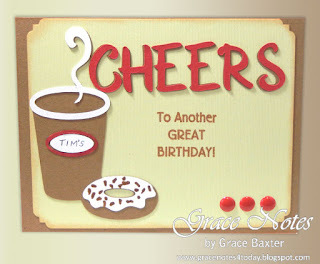 CHEERS... to Another Great Birthday! 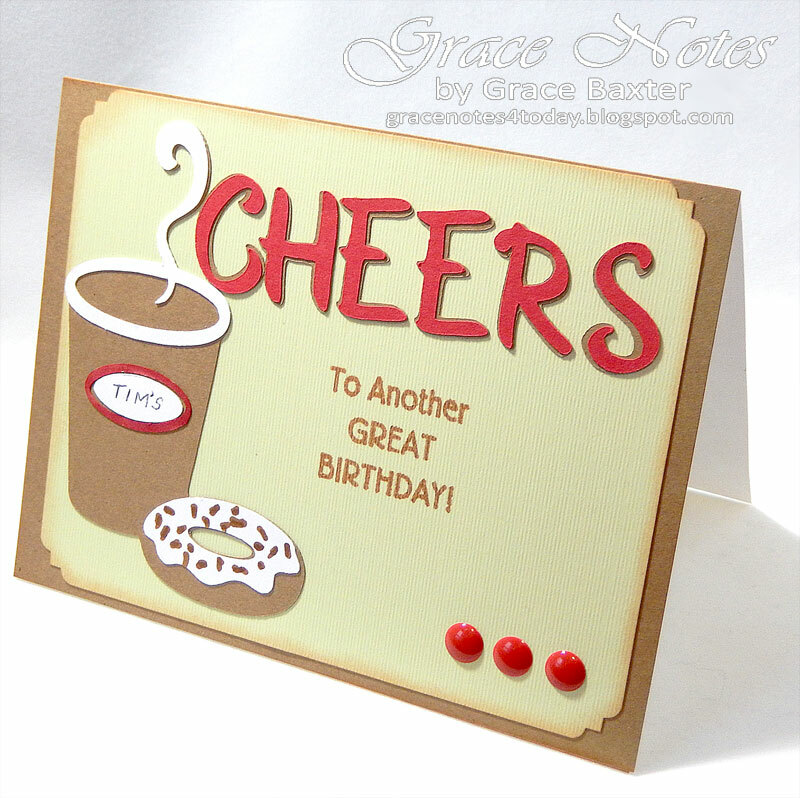 For my birthday recipient this time, I wanted to speak to his personal taste... for coffee, that is! THE most popular coffee shops in our area are Tim Horton's where there are always line-ups to get your favourite beverage and something yummy to go with it. "Tim's" (or Timmy's as they are also called) is a Canadian ICON. No wonder Cricut included it on the Go Canada cartridge. Smart move. Nothing else is quite so well known or recognized. The cardstock is coffee brown (my own name for it). It's perfect for both the coffee cup and the donut! 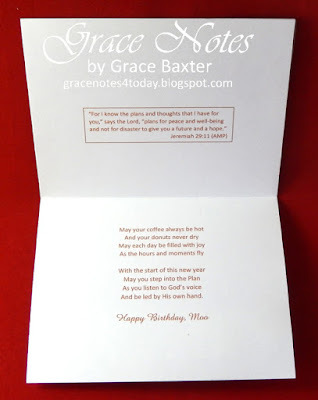 Card size is an A2, 4-1/4" x 5-1/2". And don't you love the rim? It looks puffy, just the way the real ones are. The letters in "CHEERS" are from Suburbia, cut in red and shadowed in coffee brown. I love this font. The only tricky part of making this card was that I had to do the front message the old-fashioned way. That means, creating it on my computer in Word and placing it just right. But guess what? (I'm so excited about this)... Santa brought me a beautiful new Cricut Explore Air for Christmas and from now on, I'll be able to print all kinds of messages on my cards. Can't wait to get started with that! The coffee cup with steam and a donut are on the Go Canada cartridge. And of course, I had to write a special poem for the birthday guy. Since this birthday was the end of December, thinking about future plans is on everyone's mind. I always enjoy adding a scripture verse to cards to make them more meaningful. This card was a hit with the Birthday Guy and party guests! Yippee for you and have fun with your new Explore Air. I have the original Explore and love, love, love it. Cannot wait to see what you create. Your card is great. TFS.